Expos and trade shows can be great for growing a business but it takes care and effort to make the most of the possibilities. Trade show marketing is the key to success. There are so many regular shows where this works for as well like the beauty expo, electronic expo, design expo, baby expo, health and fitness expo, pet expo, computer expo, scrapbook expo, travel expo, womens expo, and of course world expo. Having trade show promotions can be a great way to to this. I run a competition where I collect names and emails so after the show (within 1 – 2 weeks usually) I email them a newsletter announcing the expo trade show winners. This lets me showcase the business and the different areas such as being able to shop online, the online sale shopping area, jewelry party details and more. A major difference for entrepreneurs is that creative thinking is critical for making the most of the business experience. Instead of walking up and down the aisles thinking this isnot for me, turn the thought around to, Let us find how we can possibly work together. As an example, a divorce attorney may approach a real estate company. Many of the clients of this attorney will need to sell their homes; a long term care insurance provider might look for someone specializing in helping others care for the elderly. By seeking power partners at the expos, you will be on your way to sending referrals back and forth and building business more quickly. Tip #2: Consider the Entire Program. Before you register for the expo, read the entire agenda for the day. If there are interesting seminars from which you can learn, it may be advantageous to sign up for the package including meals. As long as you are spending the time, be sure to include the education piece to move your business along. And at lunch be open to meeting new people, you never know who might sit next to you. Tip #3: Donate A Prize Related to Your Business. Another avenue for entrepreneurs to get noticed at the expos is to donate a gift related to their business. Most attendees stay long enough to see if they have won a prize. The announcements of the prize and the winners come over the microphone and many people will hear the announcement of your name and the name of your business. It is an inexpensive method for advertising and just might net you a new client. Your generosity will also be noticed by the leadership putting on the seminar. Call after the event to set an appointment to find if you might be able to conduct business with them in the future. Finally, follow-up with everyone to whom you spoke. For those with whom there may be a synergy, set up a phone call or coffee appointment; and invite everyone to subscribe to your newsletter. Everyone will be impressed with your timely follow-up. Why? It is a known fact, very few people follow-up. It will set you apart from everyone else. Remember, if you are taking time away from working on your business, then make the most of your time working for your business by thinking creatively to expand your business. 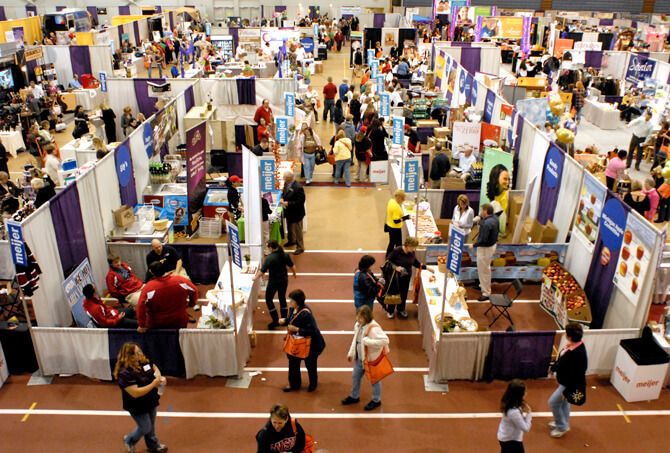 Trade show marketing is the key to success, Learn more on how you can make use of the best expo near you today!